The Grace College softball team celebrates its 2014 NCCAA Midwest Region championship on Tuesday, May 6. 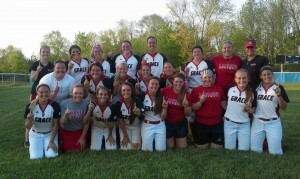 The Grace College softball team capped off its best season in nearly two decades by securing a trip to the 2014 NCCAA World Series. Grace defeated Cedarville 9-5 to win the NCCAA Midwest Region championship on Tuesday, May 6. The Lady Lancers (27-28) will play in the NCCAA World Series for the first time since 1997. The national tournament is held in Roanoke, Va., beginning May 15. Entering the regional tournament, Grace was given the No. 4 seed in the five-team field. The Lady Lancers won three straight games on Monday to earn a place in the finals. After losing 7-2 to Cedarville in the opening game on Tuesday, the automatic bid for the World Series came down to one final game between Grace and Cedarville. This time the Lady Lancers made good on their chance, claiming a 9-5 victory to punch the team’s ticket to Virginia. The Yellow Jackets struck first in the championship game and maintained a 1-0 lead over the first two innings. Hannah Adams swung momentum back in Grace’s favor with a three-run home run in the third inning. Grace seized control of the game with a five-run fourth, highlighted by two RBIs from Clarissa Knight and a two-out RBI single from Alex Shipley. Shipley, Olivia Winget and Tiffany Featherston made critical defensive plays to keep the Yellow Jackets off the scoreboard until the final inning. After Winget drove in Grace’s ninth run, Cedarville faced a 9-1 deficit in its final at-bats. The Yellow Jackets managed to score four runs, but Amanda Bowman finished the job from the mound. In the opening game against Cedarville, the Lady Lancers did not warm up their bats until the sixth inning. Grace cut a 4-0 deficit in half as Knight’s drive brought in Brooke Shell and Featherston to score during the sixth. But Cedarville ballooned its lead to 7-2 with three more tallies in the seventh inning, and Grace had no response.